Is It Safe To Travel To The Maldives? Find Out Here! The Maldives is a sought out destination for many. Whether its a honeymoon or vacation spot, the white sand, and blue waters are what makes this country highlighted bright and bold on your bucket list. Officially called the Republic of Maldives, the Maldives is located in the Indian Ocean which sits southwest of Sri Lanka and India. It is around 620 miles from the Asian continent having Malé as its capital. Malé is also its most populated city to date traditionally known as being called the Kings Island because of its central location. The Maldives consists of almost 2,000 coral islands grouped in a double chain of 26 atolls. The Natives speak Maldivian which is also known as Dhivehi but many of the natives speak English as they have one of the highest rates for literacy in the world being a whopping 98%. Depending on where you are in the world flying to the Maldives requires around 12-15 hours from Europe and around 20 hours from the USA or Canada. Although you may have to zoom in to spot the Maldives on a map there are plenty of things to do. If you have chosen to stay in the resorts, which many people prefer, there are many activities listed for you to enjoy in the time you spend there. From diving to dining here are some of the things you can do if relaxing around isn’t your thing. Diving: No need to worry if you do not have a diving certificate as there are local diving schools that will allow those without certificates to dive at least 12 meters, all you have to do is ask. Island hopping: As you know there are many islands and some are in-fact man-made but you can hop from each island to discover the different beauties lurking. Sea Life: There is a lot of sea life within those beautiful blue waters including dolphins. So why not spot some dolphins whilst checking out the beautiful view? You will definitely not be phased by manta rays as this country has the world’s largest population of manta rays, you can snorkel and check out what lies beneath. 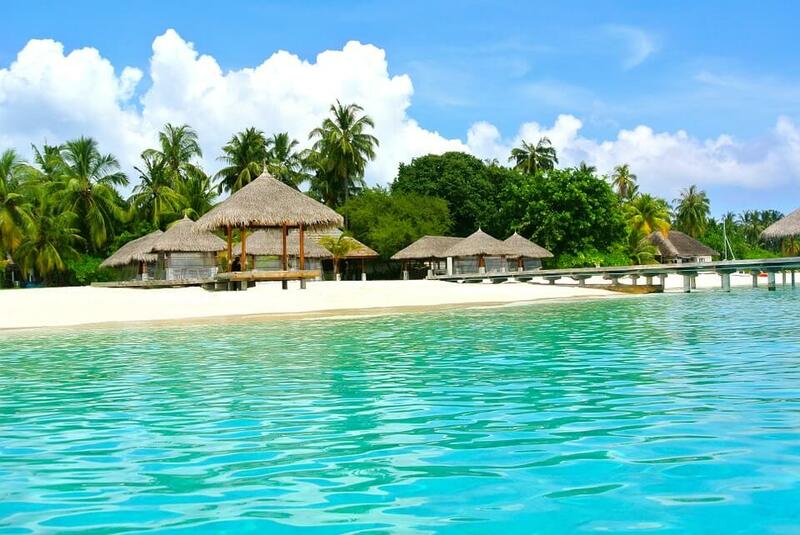 Tours: The Maldives has such a rich history that the tours of the country would be hard to miss. You can explore the ruins, city, and islands to see what amazing chunk of history you can learn. There are many tours available that you can book to jam pack your days. Religious Tours: Being a 100% Islamic, country The Maldives have some beautiful mosques which the locals will encourage you to explore. By being all Muslim country the locals are not permitted to sell or drink alcohol but if you are in a resort you would be able to purchase it there. Another thing to know is exercising anything other than Islam is something you should not do publicly as it is against the culture. Eating: Maldivian cuisine is also what makes the Maldives so famous. Its Mixture of Arabic, Sri Lankan, Oriental and Indian flavours will send your taste buds soaring especially if a kick of spice is your thing. You will be able to taste everything the Maldives has to offer from freshly caught seafood to filling dishes, curries, and soups that will melt in your mouth. Usually having sunshine all year round with very little rainfall, The Maldives has a reputation that is well-deserved. With their blue skies and sunshine with high temperatures, your activity sessions shouldn’t be disturbed by the pitter patter of rain. Although a bit of rain never hurt anyone especially when there is still heat. So as it shows you’re not short of the many things to do in the Maldives. The Big Question, is it Safe? As a person who travels you would want to know whether or not the country you’re visiting is safe enough for you to travel to. Last year February president Abdulla Yameen decided, due to the risk that was posed to national security, to declare a state of emergency which lasted for about 45 days. His response to lifting the state of emergency so soon was that he wanted things to return to normal. The state of emergency was declared giving security forces powers to arrest suspected opposition members, prohibit public gatherings and impose travel restrictions. This, however, said by The Foreign Office, would not affect the outlying islands which house all the luxury resorts as well as Malé’s International airport. The FCO issued warnings to tourists to be cautious and avoid any form of protest and rallies exercised by the locals within the city in response to their deepening political crisis at that time. The FCO has updated their terror guidance warning that an attack on the country was highly unlikely. Although in November two people to be associated with the Islamic state had been charged on planning a bomb attack on Malé but that was very quickly nipped in the bud. Tourism Minister Moosa Zameer said the government will continue to take all possible measures to ensure the security and safety of tourists following everything that has happened recently. Zameer also stated that so far they have absolutely no reports of any threat to the Maldives and that there is no danger to the tourists visiting the country. So there we have it, everywhere you go always has something, but in regards to threatening attacks, the Maldivian government has assured everyone that there are no threats and that it is totally safe for tourists! We just need to make sure we stay out of protests and rallies. You will be able to enjoy this beautiful country with beautiful blue waters, white sand and sunshine all year round.